We see it with iPhones every time a new model comes out. When there’s a big, hot Christmas toy, we notice it too. It’s high demand and low supply. It’s something everyone wants, but something not everyone can obtain. And while most of us only cared to dissect supply and demand in Econ 101, we simply can’t disregard it. The term lives with us every single day. For instance, when you drive your car to work and back, you begin to run out of gas. Eventually, you’ll have to go to your local Shell or BP to fill up your car’s gas tank. Some of you may shop around for the lowest price, while others see that a two-penny difference in price per gallon just doesn’t make a difference to your bank account’s bottom line. Regardless, you decide to spend $3.75 on each gallon of gas, draining your bank account nearly every time you hit the pump. It’s a problem, no doubt. If you’re financial situation is rough during this recession, going to the gas station is no joyful event. But could you imagine if oil wasn’t so difficult for the majority of the Western World to acquire? We’d have an abundance of it, allowing the prices to drop and us all to worry about spending our money on more important things like daily fantasy games. Supply and demand live with us daily. You want a huge Vanilla Latte from Starbucks? Well, go ahead and spend a Lincoln on it, and I’m not talking about a penny. As long as Starbucks keeps putting crack in their coffee, the general public is going to continue to spend a considerable amount of money on something that costs fifty cents to make. So while we know the concept of supply and demand is with us on the reg, why do we disregard it with fantasy football? Supply and demand is simply the relationship between how many “widgets” there are to how many “widgets” are needed. If there are more than enough “widgets” to go around, then there’s less of a price tag on these “widgets”. In a standard fantasy football lineup, you typically start one quarterback, two to three running backs, and two to three wide receivers. I say “three” because most leagues have introduced the flex position to their lineups. If there’s no flex, typically two running backs would be started, and three wide receivers. So, in other words, you need more running backs and wide receivers than you do quarterbacks. The demand for these positions is higher than any other position. This is something that cannot be argued, unless the standard fantasy lineup is altered. Is the supply consistent from one position to the other? Well, that’s where you start the disagreement, and where you begin to see a fluctuation from one expert’s fantasy rankings to another. Let me first introduce this section by talking about the fantasy football “pool of players”. Clearly each offensive player isn’t a viable fantasy play each week. And this is especially true at wide receiver and running back. With quarterbacks, you can almost find a reason to start any of them – even the Blaine Gabberts – each week given a particular matchup. He’s just a low-end starter. I’ve defined the fantasy “pool of players” by players who consistently get touches in each game they play. 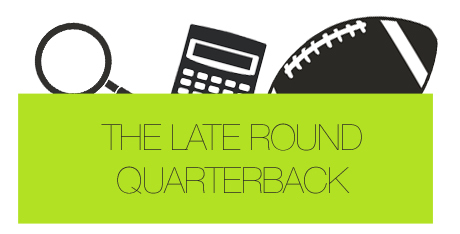 There are 32 teams in the NFL, and each start one quarterback…even Matt Cassel counts here. Therefore, the pool, or supply, of quarterbacks is 32. Now, of course you’ll see situations where someone like Tim Tebow steals snaps from Mark Sanchez or someone loses a starting job, but from a hypothetical standpoint, 32 is our number. At wide receiver, there are approximately 2 to 3 from each team catching passes regularly each week. That’s fair, right? Remember, I’m just talking high-level here. Your pool of wide receivers to choose from come draft time is 75 players deep. Running back is a little more difficult to analyze. While there are only 32 true starters at the position, we’re aware that about half of NFL teams use a running back-by-committee system. So because of this, the number we’re looking at isn’t 32, but somewhere around the 45 mark. So if we need 2 or 3 running backs and wide receivers and just one quarterback, shouldn’t we conclude running backs and receivers are more important than quarterbacks given supply and demand? All in all, you need a higher percentage of the total pool in order to satisfy your lineup’s needs at wide receiver and running back. In other words, you need more of the market at running back and receiver to get a solid lineup, thus, raising the pretend prices of these positions. So why were quarterbacks drafted early this season if the overall need for them is less? Because of value based drafting. VBD tells us that the value of a player is determined by how well he outperforms his peers at his position. To put another way, Aaron Rodgers’ value exists only by how well he does compared to the rest of the quarterbacks. It doesn’t matter how well he does against Marshawn Lynch, because that’s not where a team is gaining a competitive edge. A team gains an edge by having the most valuable players at each position. In the section above, I explained supply and demand looking at the talent of each position linearly. If Aaron Rodgers is the best quarterback, and his point value is “X”, then Drew Brees, the second quarterback, is “X-5”. And the third best quarterback, Tom Brady, is “X-10”. The same would hold true for running backs and receivers. But we know this isn’t true, which is why VBD is so important. It looks at things from a point value perspective and helps guide fantasy owners to determine the demand of a particular player and position. For example, if we knew Aaron Rodgers would score 500 points more than any other quarterback, and each receiver and running back were replaceable with one another, then Aaron Rodgers would be the player highest in demand in a fantasy draft. Next, you do some value based drafting analysis. This is the quantitative piece. If you see a player far outperforming his peers from a fantasy point standpoint, you may want to look to secure him. This is why so many people went for Aaron Rodgers this year – because he was so good compared to others in average points per game last season. The same can be said about Calvin Johnson, Rob Gronkowski and Jimmy Graham. You’re starting a local grilled cheese food cart business. There are 11 other grilled cheese food carts in your town’s downtown area (your town loves grilled cheese), and each cater to three separate demographics: Business men and women, non-working hipsters and stay-at-home mothers. Your business is eliminated 6 months after opening, and doesn’t make the playo..I mean goes bankrupt. People – running backs are the business men and women of fantasy football. And until something drastic changes year over year with VBD, this fact will stay the same.